Work abroad specialist, BUNAC, claims that, in spite of the romantic appeal of solo backpacking Down Under, there is still a significant number of young travellers looking for the human support and security of booking a working holiday package. This fact was borne out recently when BUNAC reached a landmark 25,000 participants on its Work Australia programme since it started in 1989. To celebrate, the organisation, which is part of STA Travel, is offering a free working holiday visa worth £299 to anyone who books its Ultimate Fun package to Australia with a group flight. The offer, which is valid for bookings made between now and 15th May 2016, allows young adventurers to meet up to 40 other like-minded travellers on a group flight Down Under that includes a three-day stopover in Hong Kong. Trips can be booked up to a year in advance. Plus, the Ultimate Fun package, which is designed for 18 to 30 year-olds looking to work in Oz for up to a year, enables participants to benefit from BUNAC’s Australian recruitment agency and job placement services, as well as help to find accommodation, advice on tax, healthcare and bank accounts, seven days of fun activities on arrival in Sydney and ongoing support and social get-togethers throughout their stay. Around 40 to 50 people depart every month on the group flights, so there is plenty of opportunity to meet other travellers, many of whom will form part of a BUNACer’s support network during their overseas stay, and even become lifelong friends. Almost all of BUNAC’s staff has visited Australia, and the company also has Australian employees in London. 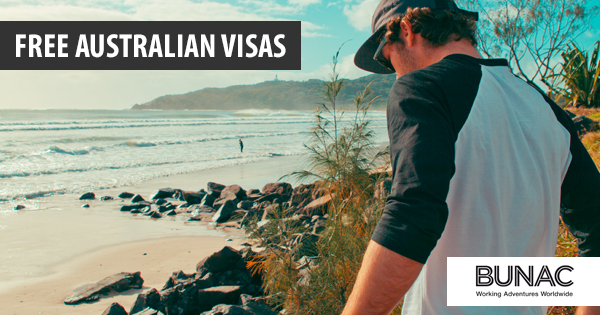 Consequently, they are extremely knowledgeable and can answer any questions that students and young people interested in the working holiday visa offer may ask. Travellers can secure a place on the programme, group flight and working holiday visa with a deposit of just £250, with the remaining balance due 10 weeks before departure. What’s more, BUNAC takes away the stress by handling the visa application process from start to finish. The 12-month Work Australia Ultimate Fun programme costs £599 in total, and the group flight with Hong Kong stopover costs from £980 pp. For further details or to register for Work Australia, visit http://www.bunac.org or, to speak with a member of the BUNAC team, telephone 033 3999 7516.